Classic tour in the heart of the production of one of the most renowned wines in the world. First stop in Roddi with its Castle seat of Cooking Courses and of the University for Truffle Dogs. Going through the Tanaro valley, we move to Verduno for a stop at the Wine Shop and to overlook the panoramic viewpoint. 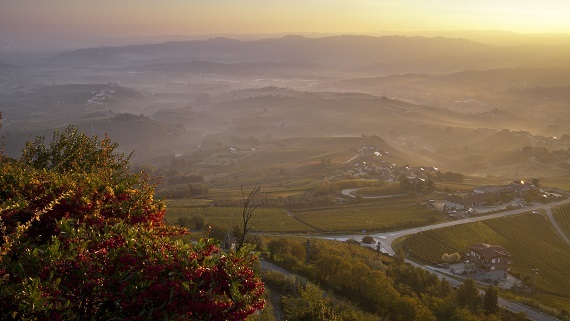 However the sea of vineyards can be admired from La Morra, typical village of the Langa, enriched by some precious elements of Piedmontese Baroque. We suggest you a short detour towards the Chapel of Barolo, whose colours stand out among the vineyards. Then we go up again to reach Barolo, where the imposing Castle Falletti, seat of the Wine Museum and Regional Wine Promotion Board, welcomes us. Walking along the village don’t miss the interesting Corkscrew Museum! Drive towards Monforte, to enjoy its borough and open air Auditorium. To complete your tour you can’t miss Serralunga, with its 14th century fortress and Grinzane Cavour, seat of the first Regional Wine Promotion Board, today Unesco cultural heritage.